In the autumn of 2016, Cotswold Archaeology excavated a site on land previously owned by Dings Crusaders Rugby Football Club, Stoke Gifford, prior to development of the site for housing by Redrow Homes South West. 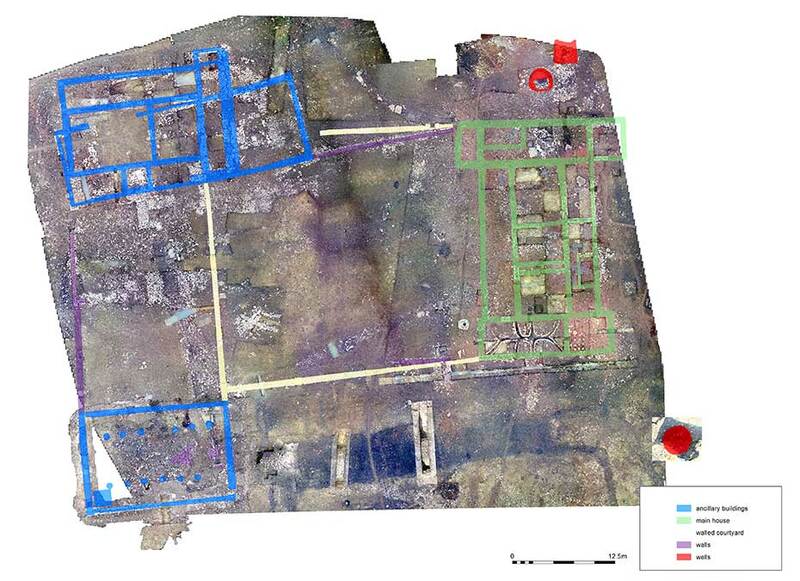 Archaeological fieldwork was completed in March 2018 and CgMs Heritage acted as archaeological consultants throughout the archaeological works. 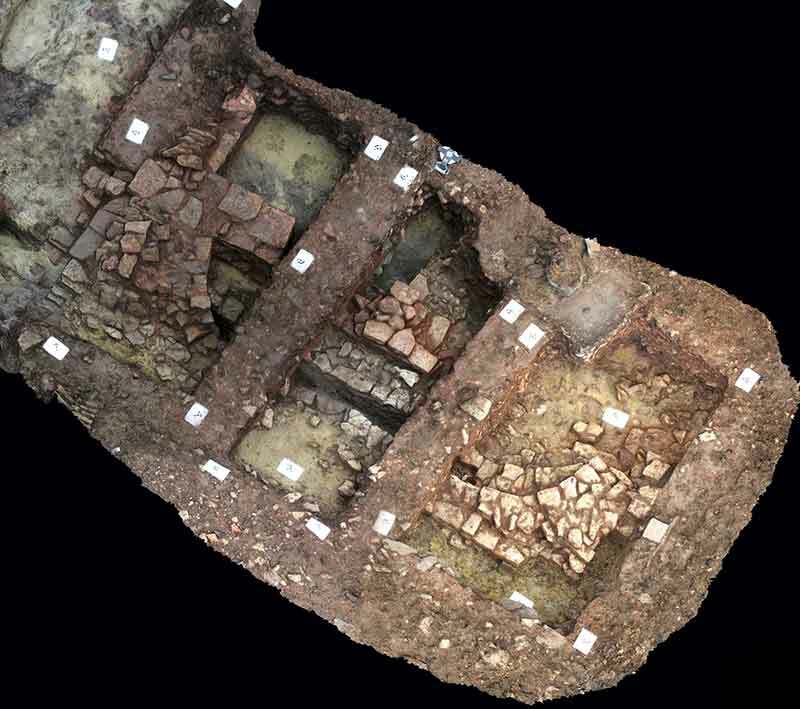 The excavation revealed remarkable evidence for a Roman villa and many associated features. While many of the villa’s walls and floor surfaces had been removed once the building fell into disuse, in some areas intact walls and floors survived, allowing us to get a good understanding of the layout of the villa. Well-preserved features included the remains of hypocausts and evidence for a courtyard or garden, as well as a series of outbuildings, external to the main courtyard and house. 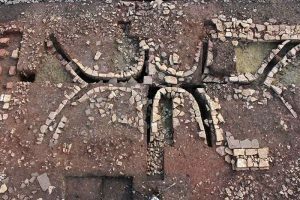 The complete, modern excavation of a Romano-British villa is immensely exciting as it provides us with a rare opportunity to consider the function and socio-economic status of such sites in detail. Many Roman villas were excavated in the 19th and early 20th centuries, before the advent of modern archaeological techniques. The excavation of the main villa building, courtyard and ancillary buildings has provided us with the chance to gather exceptionally important information about the development and organisation of Romano-British villa estates. While we will only gain a proper understanding of the site through full post-excavation analysis, we are already able to say a good deal about the development of this villa over time. The site began during the Late Iron Age or Early Roman period as a sub-oval enclosure, which contained a roundhouse and a scatter of associated pits and postholes. During the early Roman period, perhaps during the 1st to 2nd centuries AD, fields, paddocks and trackways were laid out over part of the site, replacing the earlier enclosure. Between the 2nd and late 3rd/early 4th centuries AD the site was occupied by a timber structure with at least two rooms, along with a broadly contemporary rectangular stone-built building. This seems to have been a barn, and it produced good evidence for industrial or agricultural processing. The settlement was completely remodelled in the later Roman period, during the later 3rd or 4th centuries, when a substantial residence, a walled courtyard and a range of ancillary buildings were built over the remains of the earlier buildings. This later complex evidently developed over time, with at least three phases of construction identified. The main house originated as a simple rectangular building containing three rooms, but over time projecting wings were added to the north and south, while the north wing was sub-divided into three rooms, including a kitchen. In the south wing there was a large living room, heated by a channelled hypocaust system. A further development included the addition of a range of rooms to the rear of the building, one of which contained a hypocaust system. At this stage a portico was also added to the front of the house, extending between the projecting wings. The main house had now reached its maximum extent, c. 29m long and c. 21m wide. In the post-Roman period the floors and wall foundations were robbed out, presumably for use elsewhere, although it is unclear when this robbing occurred. There is little evidence for activity between the Roman and later post-medieval periods. A number of ditches and furrows attest to the agricultural use of the site during the post-medieval period, until it was developed as the rugby club in the 1940’s. The excavations produced a wide range of evidence, which may be of use for telling us about the function of the villa and earlier buildings (and whether this changed over time), along with insights into the social status and perhaps even some of the beliefs of the settlement’s occupants. Discoveries included an inhumation burial, probably dating to the late 2nd or 3rd century AD and a human cremation, buried within a small pottery vessel. The site produced a rich finds assemblage, including dress accessories, a coin hoard, and, most interesting of all, an extremely rare bronze hanging lamp. This exciting object has been examined by Anthony Beeson, and is the subject of our recent website story.